I was offered the chance to take over the grounds of Fairplex, home to the Los Angles County Fair, in August, 1992. I resigned from my position of 17 years as Lecturer/Nursery Technician for the Department of Ornamental Horticulture at California State Polytechnic University, Pomona. One of the major problem areas I needed to tackle as quickly as possible was to initiate a proper feeding program to the 600+ acres that comprises Fairplex, Los Angles County Fair and Exposition Complex. We have a fair amount of palms, as do many large areas in Southern California, and most of which were exhibiting classic deficiency symptoms. Yellowing or necrosis of the fronds with age, some with frizzle top. Granular top application were working, but over.under applications were problems, as were fairly often repeat applications. As I had hoped and anticipated, the Spikes have worked quite well on our palms. I am currently planning orders for our second year application. One funny side note. If your palms are in a grass area that is being grown with lower rates of nitrogen to decrease mowing frequency, beware. You will develop nice little circles about 8 inches in diameter above the area where the spike was inserted into the soil. This can be eliminated by general feeding of the lawn area, but you will increase your mowing frequency. But the lawn will look better. Thanks for your follow-up interest in your customers. It is a nice touch in the business world to know that someone really does care. In 1987 when Charles Lewison was superintendent at Dunedin C.C, Dunedin, FL., he tried and compared broadcasting, liquid injection and foliar spraying on 395 palms. Each method has major drawbacks, Lewison points out. In broadcasting, the fertilizer has to work its way through grass and thatch. In the process, rain and irrigation cause premature loss. The liquid injection dissipated even faster and foliar spraying required frequent applications. Hearing of my frustrations, the Lutz Corporation developed their spikes, says Lewison. In 1989 we used the spikes on 25 palms, and broadcasting and my drill/pour method on 360 palms. The other 10 palms were left untreated for comparison purposes. The drill/pour and broadcasting took effect slightly sooner, but after 90 to 120 days those palms were again starting to show symptoms of deficiency. 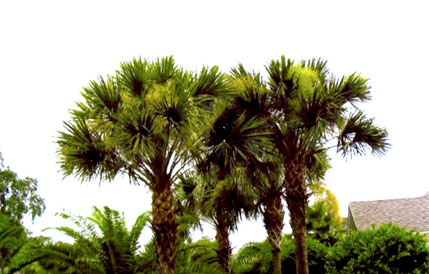 The 25 palms fed with Lutz spikes continued to show healthy green-up and top growth, reports Lewison. To determine why this was happening, Lewison dug down to where the spikes had been placed. We found at least 50% of each spike still available for continued feeding. We were unable to find any trace of the poured fertilizer. This confirms Dr. Hunter’s research that 70% of granular fertilizer is lost after 10 inches of water. After one year the Lutz/Spiked palms, while showing little if any deficiency symptoms, could probably use a maintenance treatment. The Lutz spikes not only cut our labor time, but in the process, completely out-performed the other feeding methods. As a result, we have gone 100% to Lutz spikes, Says Lewison. I just wanted to tell Mr. Lutz that I have purchased all three spikes to treat my queen Palms in the desert. It has been about three months and ALL 15 of my queen Palms have healthy spikes coming out with new lush green foliage! Amazing! I am telling all of my neighbors about your product. You saved my trees; I was going to cut them down and replace them with Mexican Fans. I will be a client for life. I thought you would appreciate the enclosed photographs of how effective your fertilizer maintenance Spikes have been on our Palm trees planted in 1999. We are located 2 ½ miles from the Atlantic Ocean and the low temperatures rarely go lower than 28F. Our soil as you might expect is very sandy with good drainage. The Sable palms have fortunately not grown significantly taller but have extremely large heads with great color. The Canary Island palms were only 3 feet in height when planted 5 years ago and have become magnificent that people stop and take photographs. Once a year, early April, fertilizing has been made far easier with your custom Fast/Planter. You must get a high percentage of nutrients compared to other methods and I am certain the palms enjoy the slow release of the fertilizer. This letter is both an endorsement of your products and an additional order. As you know, I live in Charlotte, NC and grow cold-hardy palms outdoors. I have been using your palm maintenance spikes, along with the manganese spikes, for about 5 years. I have been very pleased with the results on my windmill, sable minor, needle, and sago palms. 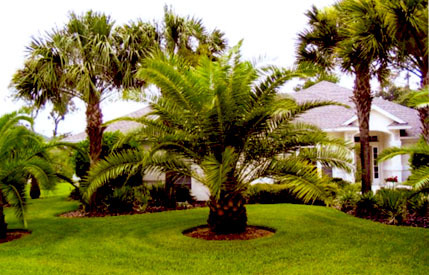 Healthy palms help weather cold winters better in marginal climates like this one. I have been so pleased with your products that I gave them an unsolicited endorsement recently on the Internet Website called "Hardy Palms and Subtropicals". Visitors to this site live in Washington state, Virginia, North Carolina, Tennessee, and the like. The Message Board is chock-full of amateur palm enthusiasts like me, describing their palms and ways of keeping them thriving. Please send me a 20 pack of the Lutz Palm Maintenance Spikes along with a 20 pack of the Palm Manganese (Mn) Spikes. I enjoy your company’s professionalism and service. I’ll await the receipt of the shipment along with the invoice. Thanks you. The Lutz Palm Tree Spikes saved my 3 Queen Palms. While visiting my local hardware store, I came across the Lutz Palm Tree Spikes. I read the brochure and was quite surprised that my Queen Palms looked very much like the one featured in the flyer. I purchased 30 of these spikes for my Palms and went home and planted them and prayed that my Queens would survive. It took approximately 1 month to see the results on the 2 Queens and 3 months on our 15 year old Queen that had not only suffered Manganese deficiency but our brutal summer in Phoenix, Arizona. I really did think this tree was not going to make it. So far this tree is showing considerable improvement and appears that it will make a full recovery. I would like to thank the Lutz Corporation for bringing such a wonderful product to market. I have recommended your product to the landscaping company that I work for and they have been very satisfied as well with their performance. I thank you again for saving three of my favorite trees. After two years of virtually no growth on my transplanted Queen palms, I was considering replacing them. As a last resort, I put down some Lutz spikes about six months ago. Today these palms have all kinds of healthy, new, deep green growth. I just can’t say enough about the Lutz Palm Tree Spikes. I would strongly recommend them for anyone who hasn’t experienced recent growth on their palm trees. We have used the fertilizer Spikes for almost two years. They are easy to install and seem to give us favorable results. We have used your Maintenance spikes now for about a year & half and they have performed well for us. Our applications have been hotels with tropical atriums and commercial business’ with an average of 30 palms. 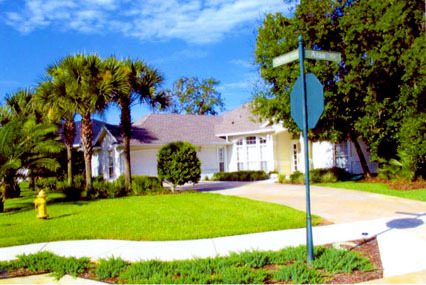 They also sell well to the average residential accounts of about 2 to 6 palms. A few days after I mailed you a note of favorable comments Rick came in from one of our regular accounts of 57 palms and he was quite excited. He said that five months ago, as he was trimming the palms, he noticed a slight crack in the head of one 60 footer. He didn’t feel it was safe enough to climb and recommended removal. The customer asked if there was any other solution and Rick said he could try Lutz Spike and see what happens. He then fed the Palm 9 spikes. Now, 5 months later he climbed the tree and was surprised to discover that the crack was totally mended. We thought you’d like to know! Lumberjack Tree Service & Paradise Palms, Inc. I have already received my Palm Maintenance Spikes for this season. They are doing an excellent job. I will be applying them to additional palms this year while holding off spikes on those trees treated last year. I am trying to determine if the spikes are good for two seasons. I wanted to write and let you know the results I have had using Lutz Maintenance Spikes. I am the Interiorscape manager for Laurel Creek Nursery. In the past potted palms have been used infrequently in our accounts. One of the reasons for this was the difficulty supplying proper nutrients to palms. Our customers would complain of yellowing fronds, and curled leaves. Close inspection would reveal orange specks in the yellowed fronds, and a few necrotic margins. Many thanks for developing this product. We have been using the Lutz Palm Tree Maintenance Spike for about three years. They outperform similar granular type fertilizers by correcting nutrient deficiencies faster and more effectively. We also recommend them to our retail customers. Your manganese spikes saved two of my mature Queen palms. They worked wonders! Looking forward to using the maintenance spikes to really green them up. The palm tree that we bought back to life with your spikes is still doing fine. Full crown of 8 deep green fronds! Also, the five cluster palms, in center of front yard are doing great - along with the 10¢ store house Philodendrons, which are growing up the palm tree trunks. The Philodendrons, now have leaves that are 14" wide + some 20 to 25" long - the only thing that they have had as food - is 8 of your spikes that I put around the cluster of palms. The Philodendrons not only have huge leaves - but have grown almost up to the palm crowns! Another species of plant that likes you spikes is Exoria. They get the runoff from the original palm that was nipped by frost in patio entrance way. They also are looking better than ever before - they have deep green leaves - with clusters of numerous red flowers. Again the only thing that was done differently was about 10 of your spikes. I am very happy to report that using your Palm Tree Manganese Spikes cured my Iron Chlorosis in my 5 yr old Red Maple Tree. Long story short, I live in Indiana and my heavy clay soil was tested to be 7.4 - quite alkaline; the only saving grace is that the soil had decent organic matter. When I planted 2" caliper tree 14 yrs ago, it was planted near new construction. I of course added lots of organic matter (Horse manure & mulch) over the years. Did OK 1st 4 yrs then when tree was about 3' caliper, the leaves in late Spring developed signs of Iron Chlorosis so I added sulfur in Early Spring and Late Late Fall, Jobes Stakes, Manure, etc. These all helped a little bit but the leaves especially in mid summer still showed weak green color. Problem still existed. Finally, fed up that my tree showed faint signs of leaf yellowing, I tried your Manganese Spikes in 2012. Today, 5 yrs later I have a very healthy Red Maple that has grown to 6" caliper. My Swamp Oak showed no issues but I am convinced that the Manganese Spikes helped it too. I am back from Afghanistan and look forward to pruning both my Red Maple and Swamp White Oak trees. Ran out of Lutz Manganese Spikes last year and will order more soon! Perhaps get the Red Maple / River Birch Spikes this time. Martha Stewart uses our tablets on her potted citrus trees! Click the link below to view her video on fertilizing citrus trees. I am just letting you know how pleased I am with your citrus tablets. I have a Duncan Grapefruit tree, a Robinson Tangerine and a Satsuma plus a Meyer lemon. I placed your tablets as you recommended around the trees in February and it appears that I will be getting the largest harvest ever. The even coverage and the lack of run off seems to have done the trick. This was a short note just to state I will be back to order more when needed. Thanks again for your attention to your customer. Your Citrus Tablets are absolutely great. I’m sold on them. Your customer service is super as well. My trees have never looked so good and have more fruit than ever. In addition to citrus, Mr. Joseph Powell of Powell’s Nursery in Punta Gorda, Florida has had very good success using our Super Citrus Tablets on hardwoods such as Oak, Holly, Black Olive and Mahogany. On these he recommends using only 2 to 3 tablets per inch of trunk diameter. He tells me he has seen these trees go from a 2" caliper and about 8’ high to 3" caliper and 12’ high in one year. Mr. Powell also tells me that some of his customers report the Citrus Tablets also do an excellent job on peach, apple and pear trees. Because of the chlorosis these trees have had, they would have lost about 65% to 75 % of their leaves by June 1st as they yellow and die off. Started using Lutz spikes for chlorosis in Spring of 2015 and immediately saw significant improvement in the leaf color and size. I am in year two and you can see the very vigorous growth and healthy stems and leaves due to the feeding with Lutz Spikes. The leaf size is FOUR times what it was just two years ago and a lush green color as well. Now, to be clear, these images are of two different trees just to show you the huge contrast in what Lutz product has done for me. 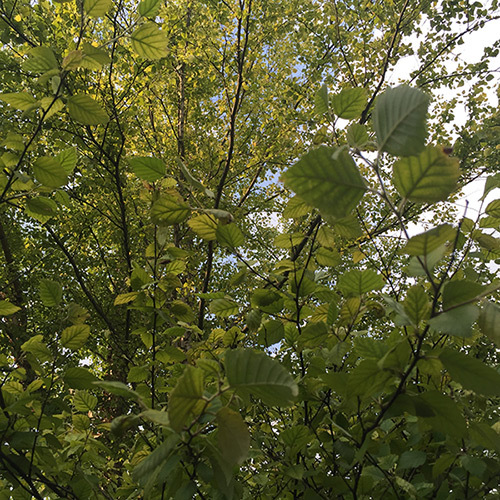 The weaker birch tree (with the chlorosis veins, yellowing on the leaves, and a little sparse) is on back side and close to the house. 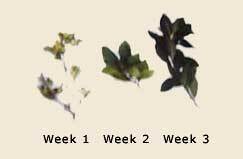 The leaching of the mortar into the soil causes the chlorosis to be worse and it will take a bit more time to get back to 100 % health but this time last year about 75 % of the leaves had fallen off and it looked like the end of October on June 1st. In my second year of treatment, 90 % of my leaves are still on tree and although not perfect, a huge improvement over last year. By next year, I believe all will be great. In the image of the very healthy tree - just 24 months ago - it looked just like the weaker birch tree image - and today - you can see the incredible results of what Lutz spikes can do for your trees. I also have Holly trees that used to have large yellow patches - again, chlorosis - but today they are all healthy and green. It takes time and best to treat over a period of 2 to 3 years for maximum results. I like to use a combination of the pellets and the spikes to maximize my result but if you will notice the second image you can see the HUGE positive results. 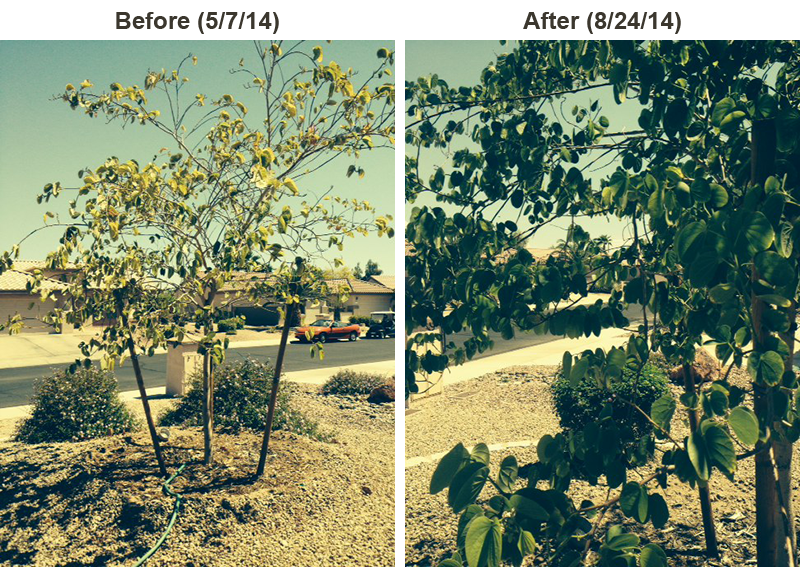 I am sold on Lutz products - and my trees are better for it! Just a note to let you know that after about 1 year remarkable improvement in our pin oak (I think, as it was bought as red oak). I tried a lot of 'juices' for about 2-3 years to help this tree out but it only got worse every spring/year and feared it would die. Nursery said there was nothing we could do for it - yea right - but your stuff did the trick. Cant wait to see how it looks next spring. Again thanks for the help. Hong Kong Orchid Tree: this tree's leaves got yellower and lost them all. We used Lutz Iron Spikes after talking to Mr. Lutz. He said the new growth would be perfect. Voila! Thank you for your card of August 31st regarding our experience with your Super Iron Chlorosis Pellets. We use the Pellets on Azaleas and Rhododendrons and have had excellent results using them. We especially like them because they last longer than other iron we have used in the past. Enclosed please find the picture of the azalea after 4 weeks. This after the application of 3 iron pellets. Our Super Iron Chlorosis Pellets are doing an outstanding job for us. We are using them on Red Oaks, Sweet Gum, and Pine trees; and on Azaleas, Photinis and Hollies as well. It was a pleasure speaking with you last week. Upon seeing an ad for your Lutz Tree Spikes I was very happy to find out I had access to them. In the past, I had been able to purchase them through a local supplier that has since gone out of business. We have tried about every other product on the market to make our Red Maples, Pin Oaks and other problem trees come out of the Chlorosis that is so common here in Northern Illinois. 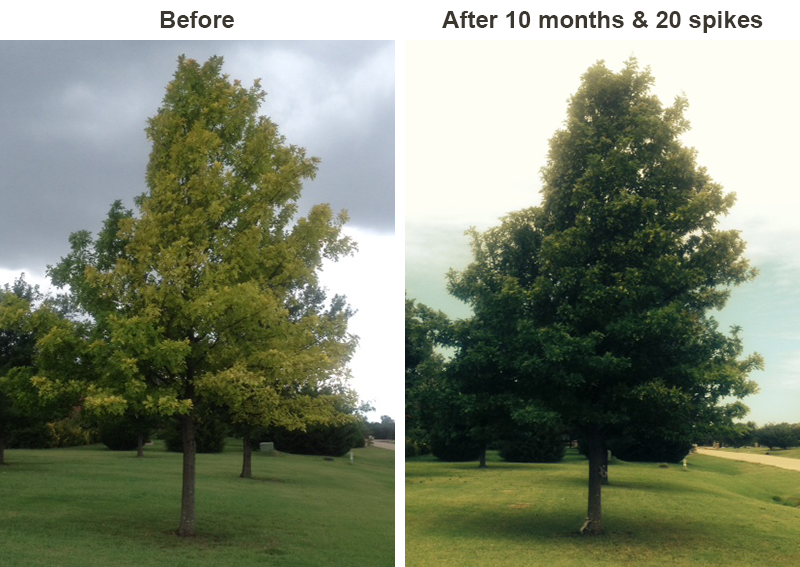 We started a program using your Lutz Manganese Spikes a few years ago and much to our surprise, our trees responded within the first year. It is very rewarding when the customers sees that the program you suggest works, not to mention the cost savings versus using liquid feed equipment. Enclosed please find our order for additional spikes. Your Manganese Spikes are doing an absolute job on a Red Maple. I feel they saved the tree. I’ve been telling my neighbors about them. The two Silver Maples that have only been fed Lutz Manganese Spikes for the last two years are the hardiest robust Maples I’ve seen in my 32 years as State Forester. We've tried many things and your Manganese Spikes are the only ones that work. We're very happy with them, as are our clients. Your Manganese Spikes have done wonders on my Red Maples and Sugar Maples. We will be ordering more come spring. Got my order on Friday and put my first set of manganese spikes in for my maples. I also got an installation tool, and I wanted to mention that I was really pleased with it. I have dense, heavy clay soil that by this time of year is like concrete. I need to stand on the stirrup with both feet and rock back and forth for 2-3 minutes to get the tool to wedge into the clay, even after watering the clay for 3-4 hours. I was worried that the installation tool would be cheap rolled sheet metal like others I've tried and fall apart in seconds, but that thing is dead solid. You really should emphasize what a robust tool it is. If the spikes work as well as the installation tool I'm going to be one extraordinarily happy customer.